A new version of Firefox Reality, Mozilla Corp.’s virtual reality web browser, now brings 360-degree video native support, bookmarks and seven new languages to the 3-D software, the company announced Thursday. Firefox Reality brought the web browser out of the land of 2-D and into virtual reality in April with its initial release. Since then, it has gained a variety of improvements that affect the user interface, ability to interact with virtual content and the number of platforms it can run on. Upon launch, Reality supported only English for its display language and voice recognition. With version 1.1, the browser’s developer team added French, Italian, German, Spanish, Chinese (simplified and traditional), Japanese and Korean. The theater viewing mode in the VR browser has also been upgraded to work with 360-degree video playback, a common format used to increase immersive experiences in VR. Also, to bring the browser more in line with standard functions found in web browsers, the new version adds search suggestions in the URL bar and the ability to bookmark web pages. Bookmarks saved in the browser can currently only be accessed locally, allowing for saving and viewing of web pages. However, Mozilla plans to release cross-platform synchronization that will allow bookmarks to be shared between mobile and headset. 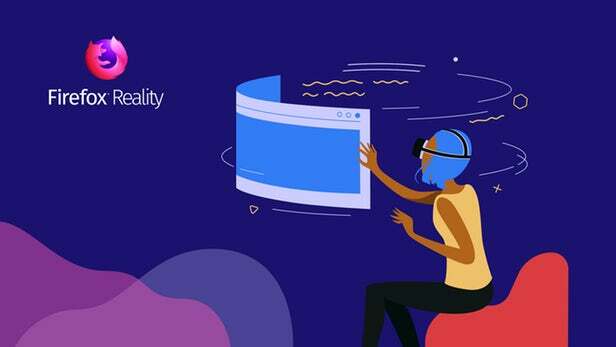 The Firefox Reality browser can now run on a large number of common VR headsets, including HTC Vive Focus, HTC VIve Wave, Oculus Go and Google Daydream. The software is available for download from HTC Viveport (search for “Firefox Reality”), Oculus store (for Go) and Google Play (for Daydream). The launch of Firefox Reality, and similar web browser software for VR, follows a trend making VR useful for not just gaming and entertainment but also as a general-purpose platform for productivity and work. With a VR headset, it is possible to change anywhere into somewhere else, thus helping to limit distractions or simply provide a separate “space” to get things done. “the aspect of the Virtual Reality block out your major perceptions of reality, visual and audio, makes it an excellent tool for reducing real-world distractions,” said virtuosVR founder Michael Eichenseer, speaking to using VR for training and work. To do this properly, all of the tools available on a workstation need to also be reflected in that virtual space. That led to the rise of tools such as the Space VR platform from Pygmal Technologies, Virtual Desktop and the Oculus Desktop (built into the Oculus operating system). Superdata Research Holdings Inc. estimates that the VR market is poised to reach $7.7 billion in revenue across hardware and software (for a combined market of virtual reality, augmented reality and mixed reality). The same report noted that nearly half of VR’s enterprise users are educational companies and institutions that use VR to assist with training employees. Forecasts of the VR market show indicate very high growth, with a revenue estimate of more than $20 billion by 2021.